The surreal, brilliant white terraces and warm, limpid pools of Pamukkale hang, like the petrified cascade of a mighty waterfall, from the rim of a steep valley side in Turkey’s picturesque southwest. Truly spectacular in its own right, the geological phenomenon that is Pamukkale, literally “Cotton Castle” in Turkish, is especially famous for its white limestone travertines shaped by calcium-rich hot springs and has been used as a thermal treatment centre for millennia. 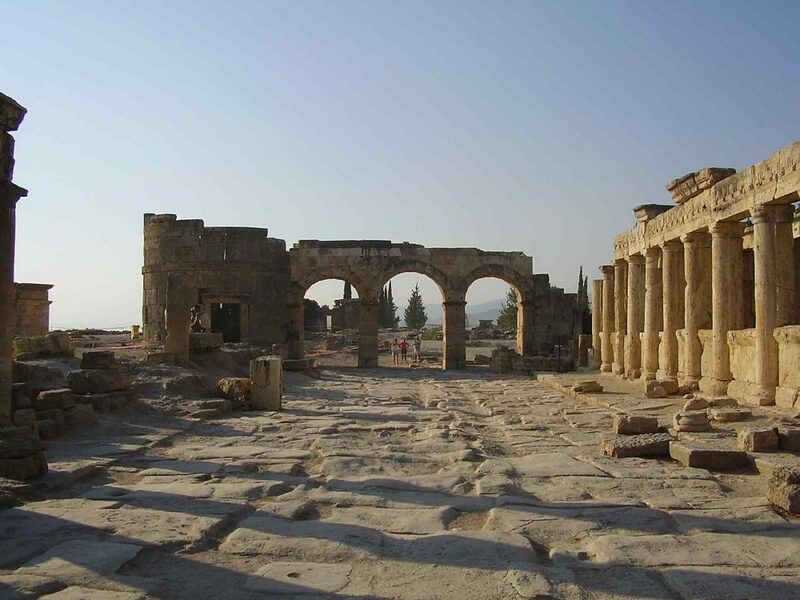 It is also the site of the remarkably well-preserved ruins of the Greek-Roman city of Hierapolis. With such a unique combination of natural and man-made wonders it’s little wonder that Pamukkale-Hierapolis has been made a Unesco World Heritage site. With over two million visitors annually, it is also Turkey’s single most visited attraction. This city of travertines has long been home to various civilizations and it is possible to trace them back from the dusty pages of history through the ruins of each ancient city. The best preserved structures belong to the ancient city of Hierapolis.